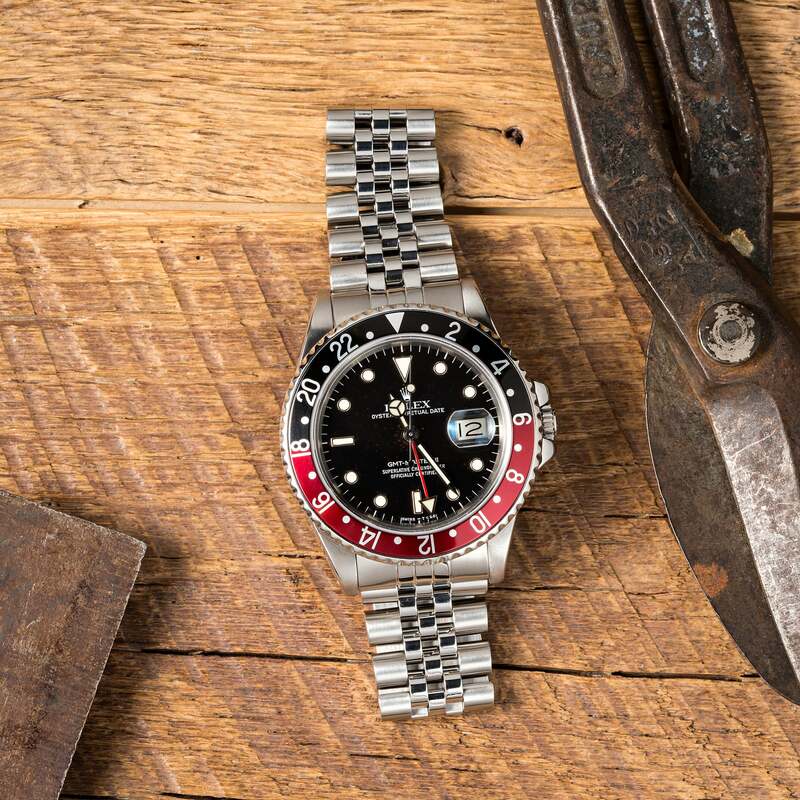 The First Rolex GMT-Master II: Coke Bezel For The "Fat Lady"
In 1983, Rolex unveiled the next chapter in their pilot watch story with a GMT-Master II to accompany their already popular GMT-Master watches. That first GMT-Master II was the ref. 16760, also known as the “Fat Lady” in Rolex collecting circles. Here we take a look at that inaugural GMT-Master II watch, as well as the differences between the GMT-Master and the GMT-Master II. 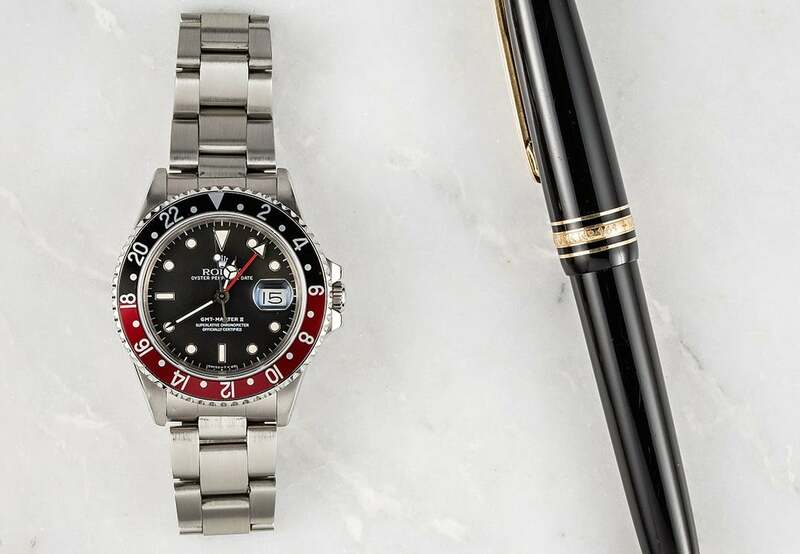 The debut of the GMT-Master II ref. 16760 introduced several modifications to the Rolex aviation watch. Most notably, the ref. 16760 housed the brand new Caliber 3085, thus allowing the adjusting of the center hour hand and the 24-hour hand to be independent of each other. The Rolex GMT-Master II ref. 16760 is called the Coke due to its black and red bezel. On previous GMT-Master models, both hour hands were linked, so when one moved, so did the other. Consequently, on the GMT-Master models, the bezel had to rotate accordingly for the 24-hour hand to indicate the second time zone of choice. However, with the new unlinking of the two hands on the GMT-Master II, the bezel can remain at the standard position (with the triangle at 12 o’clock) and the 24-hour hand can be set to home time while the center hour hand can easily “jump” to the local time when traveling to a new destination. Furthermore, the bezel can then rotate to indicate a third time zone. For instance, if the third time zone is six hours ahead of home time, then turning the bezel whereby “6” on the bezel sits at the 12 o’clock position, the 24-hour hand will now point to “22” on the bezel—therefore indicating it’s 10 pm in the third time zone. In addition to the new caliber, the new GMT-Master II ref. 16760 had other enhancements. First, it was now outfitted with sapphire crystal to protect the face of the watch. Second, it also included white gold surrounds on the luminous hour markers to prevent tarnishing. Finally, it ushered in a new bezel color—the black and red “Coke” bezel. In fact, Rolex only ever equipped the GMT-Master II ref. 16760 with the “Coke” bezel. Moreover, it was only ever available in stainless steel. The “Fat Lady” is the first Rolex GMT-Master II released. The design of the GMT-Master II ref. 16760 maintained the 40mm Oyster case, yet it was thicker to accommodate the new caliber. Additionally, the bezel of the GMT-Master II ref. 16760 was wider and its winding crown larger. As a result, these thicker, wider, and larger details came together for a GMT-Master II model that was a touch sportier and bolder than the preceding GMT-Master models. The GMT-Master II ref. 16760 was in production until about 1988. Rolex then introduced the GMT-Master II ref. 16710 to replace it. The vintage GMT-Master II ref. 16760 is a highly popular model since it boasts so many “firsts” and it’s an integral part of Rolex’s history. A cornerstone to any vintage Rolex collection, few references are as special as the Rolex GMT-Master II ref. 16760.